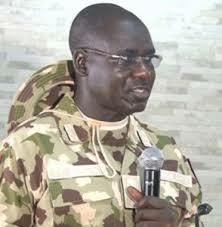 Chief of Army Staff, Lt Gen. Tukur Buratai, has commended troops in the North East for recapturing Baga, the Borno border town earlier seized by Boko haram insurgents. “I am very delighted to receive the good news of your triumphant entry, clearing of the strategic town of Baga and neutralising the Boko Haram terrorists that tested our might some days back,” Buratai said in a goodwill message sent to troops in Borno. He said the troops’ efforts, “open display of gallantry and patriotism” which helped the military to recapture the commercial town, gladdened his heart. He commended the Theatre Commander, Operation LAFIYA DOLE, Maj. Gen Benson Akinroluyo, commander of the newly-created Nigerian Army Special Forces Command and other commanders of the operation in the area. He urged the commanders and troops to consolidate on the gains by “continuous pursuit” of the insurgents. “You should be more proactive and continue with the clearance operations on any known Boko Haram terrorists’ hideouts in your respective areas of responsibilities. The Nigerian Army will continue to provide all the needed support to ensure that you succeed in this noble task,” he said. Boko Haram attacked Baga, a fishing community around the Lake Chad shores on Wednesday, December 26. But the military had earlier denied the insurgents captured the town, insisting troops were still on ground.